Mal Ahern is a PhD candidate in History of Art and the program in Film and Media Studies. 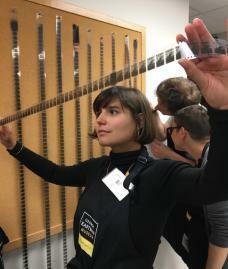 Before coming to Yale, Mal was the collection registrar at Museum of the Moving Image, where she cared for and documented a diverse collection of media-historical artifacts. In her research, Mal explores the tensions between visual signification, abstraction, and image-making technologies. Her dissertation, Form and Device: Structures of the Technical Image, 1960-1975, proposes a new vocabulary for describing the relationship between media technology and aesthetic forms in American painting, film, and video of the 1960s and 1970s. In Spring 2014, she developed and co-taught a Yale College course in Media Archeology with her advisor, Francesco Casetti. Other fields of interest include feminist theory, systems theory, science and technology studies, and philosophical aesthetics.